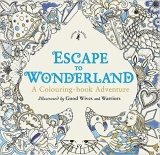 An enticing, extraordinarily intricate and beautiful colouring book filled with highly detailed line artwork that allows the magical fantasy of Alice's Adventures in Wonderland to be brought to be life in an entirely unique way. Pictures include iconic scenes from Wonderland and its array of extraordinary characters - the Mad Hatter, the Cheshire Cat and the Queen of Hearts and more - threaded with delicate patterns all clearly outlined in pen and ink, making ideal spreads to colour. Pivotal moments from the story of Alice are scattered throughout for inspiration, and there are spaces left within some of the compositions for individual design and embellishment. This highly original, exquisite colouring book for older children and adults alike is in a handy-sized square format, a perfect size to carry around in your handbag or schoolbag with a tin of crayons - you'll be ready to colour and relax wherever and whenever the moment takes you.